Known for their high quality and sustainably-sourced seafood, The Fish Stand focuses on wild-caught and organically raised seafood. Over the past couple of years, they've been expanding their pre-made and oven-ready dishes carried in store which has led to this excellent menu of delicious holiday specials. 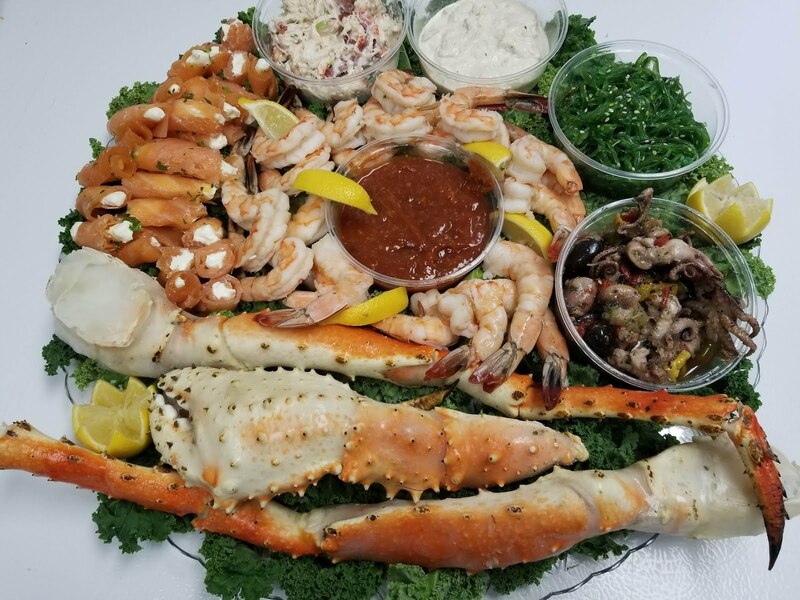 They have a wide range of dips and salads like the buffalo shrimp dip, the pulpo salad, and smoked whitefish along with fantastic party appetizers like mini Maryland-style crab cakes, salmon pinwheels and more. However, the real stars of the show, built to make your holiday entertaining as easy as possible, are their platters. With a wide range of sizes, the platters are perfect for a holiday party or for hosting Christmas or New Year's dinner. The menu includes a Shrimp Cocktail platter ranging from 2-6 lbs, an Everything (But the Bagel) platter with smoked salmon rolls stuffed with your choice of cream cheese and topped with Everything Bagel seasoning, and the Ultimate Seafood platter (shown above) with shrimp cocktail, pulpo salad, two kinds of seafood dip, smoked salmon rolls, King Crab legs, and lobster salad, amongst others. The menu is available online and in the store at 508 Jersey Ave. If you pre-order your items by 12/15, you'll receive a 10% discount off the total. Check it out today and place your order to help make your celebration special (and delicious). I'd also recommend keeping on eye on my Instagram for a special announcement later today! All photos courtesy of the The Fish Stand.